On January 1, we celebrate a new year and Haiti’s independence. Haiti was the first and only country to have successfully revolted against slavery. 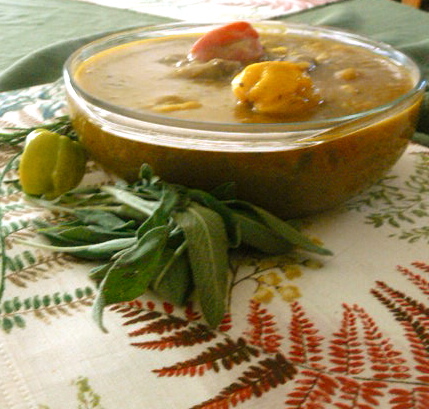 Our pride in our history is celebrated each year with a traditional pumpkin soup known as Soup Joumou. Marinate the meat overnight or for at least 1 hour. Place the seasoned meat in a stockpot and cover with water. Add oil and let boil over high heat. Keep covered until the water has evaporated. Uncover, stir and simmer a few drips of water occasionally to brown the meat. Keep stirring and simmer water occasionally until you have a nice browning color to the meat. Stir in one tbsp of tomato paste. Remove meat and set aside pot for the vegetables. In a separate bowl, cut into small pieces the large scallions and half medium cabbage. Peel & chop the potatoes, yams, malanga, butternut squash, carrots, and turnip. Wash the vegetables. In a separate pot, boil water and add the vegetables. Cover and cook over high heat for about an hour. Reduce heat and add scotch bonnet pepper. For best flavoring, pour the cooked vegetables, the squash puree and cooking liquid into the pot that cooked the meat. Add parsley, thyme, and broken spaghetti (or substitute with macaroni). Combine meat into soup. Serve hot.